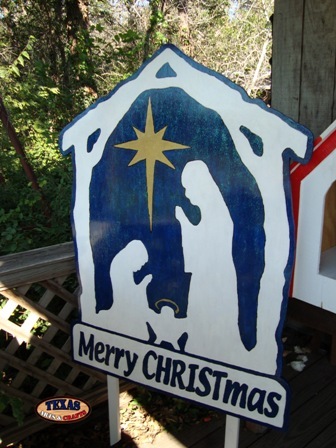 The Large Nativity Set is made in our workshop. The item is a three piece set. The first piece is Joseph. His garment is hand painted red. The second piece is Mary. Her garment is hand painted blue. The last piece is baby Jesus. His garment is hand painted white. The dimensions for Joseph are approximately 30 inches tall by 18 inches wide by 2 inches deep. This piece weighs approximately 4.25 pounds. The dimensions for Mary are approximately 27 inches tall by 15 inches wide by 2 inches deep. This piece weighs approximately 3 pounds. The dimensions for Jesus are approximately 13 inches tall by 20.50 inches wide by 2 inches deep. This piece weighs approximately 2.75 pounds. For shipping purposes the whole set will be 30 inches tall by 20.50 wide by 6 inches deep. The three pieces will weigh a total of 12 pounds with packaging. For the continental U.S. shipping and handling is included in the listed price. For shipping outside the continental U.S. please contact us through our Contact Us page. 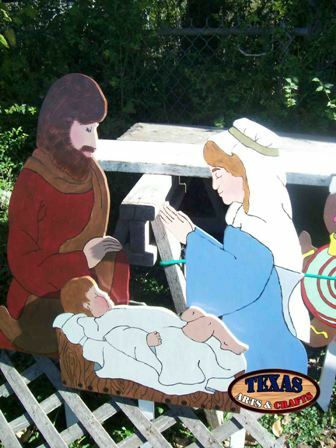 The Children Nativity is a four piece set built in our workshop. The first piece is Joseph. His garment is hand painted blue. The second piece is Mary. Her garment is hand painted pink. The third piece is baby Jesus and an angel. His garment is hand painted white, and the angel's garment is painted pink. The last piece is a lamb. The lamb is hand painted white. The dimensions for the first piece are approximately 15.50 inches tall by 8 inches wide by 2 inches deep. This piece weighs approximately 1.25 pounds. The dimensions for Mary are approximately 15.50 inches tall by 12.25 inches wide by 2 inches deep. This piece weighs approximately 1.25 pounds. 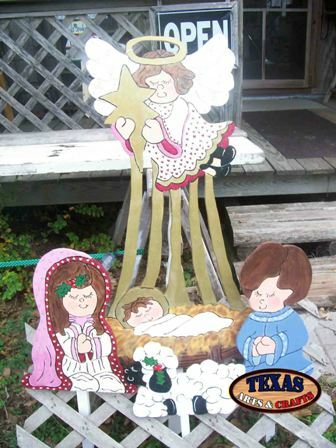 The dimensions for the baby Jesus and the angel are approximately 32.50 inches tall by 15.50 inches wide by 2 inches deep. This piece weighs approximately 3.25 pounds. The dimensions for the lamb are approximately 8 inches tall by 12 inches wide by 2 inches deep. The last piece weighs approximately .50 pounds. The four pieces will weigh a total of 12 pounds with packaging. For the continental U.S. shipping and handling is included in the listed price. For shipping outside the continental U.S. please contact us through our Contact Us page. We build the Nativity in our workshop. 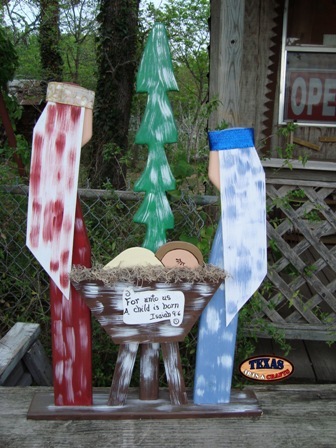 Joseph is hand painted red, Mary is hand painted blue, Jesus is hand painted off white, the manger is hand painted brown, and the tree is hand painted green. The plaque on the manger reads: For Unto Us A Child Is Born Isaiah 9:6. The dimensions are approximately 34.50 inches tall by 22 inches wide by 3.50 inches deep. This piece is very delicate and can only be picked up at our store. We build the Blue and White Nativity in our workshop. Joseph, Mary, and Jesus are hand painted white. The background is hand painted blue. The star is hand painted gold. It reads Merry Christmas in blue lettering. 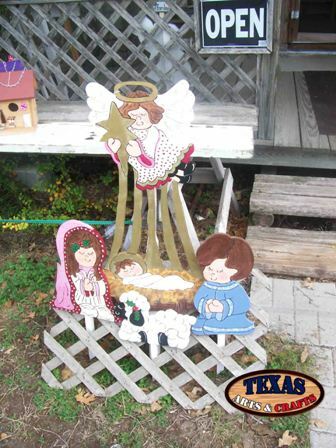 The dimensions are approximately 47 inches tall by 35 inches wide by 2 inches deep. It has two stakes each 48 inches tall. This piece is very large and can only be picked up at our store or craft show.